Economists (with a few notable exceptions) have long behaved as though growth were synonymous with economic health. If the gross national product of a country increases steadily by 4 percent per year, most economists express approval and say that the economy is healthy. If the economy could be made to grow still faster (they maintain), it would be still healthier. If the growth rate should fall, economic illness would be diagnosed. However, it is obvious that on a finite Earth, neither population growth nor economic growth can continue indefinitely. But why do economists cling almost religiously to the idea of growth? In general, growth brings profits to speculators. For example, purchase of land on the outskirts of a growing city will be rewarded as the land increases in value. ; and when the economy grows, stocks rise in value. Today, as economic growth falters, the defects and injustices of our banking system have come sharply into focus, and light has also been thrown onto the much-too-cozy relationship between banking and government. The collapse of banks during the subprime mortgage crisis of 2008 and their subsequent bailout by means of the taxpayer’s money can give us an insight into both phenomena – the faults of our banking system and its infiltration into the halls of government. The same can be said of the present national debt crisis in the Euro zone and elsewhere. One feature of banking that cries out for reform is “fractional reserve banking”, i.e. the practice whereby private banks keep only a tiny fraction of the money entrusted to them by their depositors, and lend out all the remaining amount. By doing so, the banks are in effect coining their own money and putting it into circulation, a prerogative that ought to be reserved for governments. Under the system of fractional reserve banking, profits from any expansion of the money supply go to private banks rather than being used by the government to provide social services. This is basically fraudulent and unjust; the banks are in effect issuing their own counterfeit money. When the economy contracts instead of expanding, the effect of fractional reserve banking is still worse. In that case the depositors ask the banks for their money, which it is their right to do. But the banks do not have the money – they have lent it out, and thus they fail. However, the bankers have insured themselves against this eventuality by buying the votes of government officials. Thus the banks are bailed out and the taxpayers are left with the bill, as in the recent example in which the US Federal Reserve secretly gave 7.7 trillion of the taxpayers’ dollars to bail out various banks. Today we are able to estimate the population of the world at various periods in history, and we can also make estimates of global population in prehistoric times. Looking at the data, we can see that the global population of humans has not followed an exponential curve as a function of time, but has instead followed a hyperbolic trajectory. The simple mathematical curve that fits best to human population data over the last 3,000 years is not an exponential increase, but rather a hyperbola of the form P=C/(2025-t). 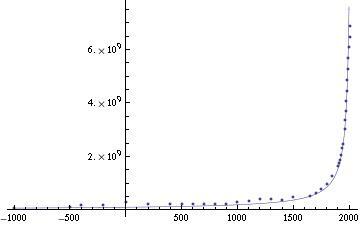 Here P represents population, C=190,000,000,000 and t is the year. The curve goes to infinity at t=2025 (only a few years away), which is of course impossible. Global population has already started to fall away from the hyperbolic trajectory. Will it level off, or will it crash disastrously? Because of the enormous amount of human suffering that would be involved in a population crash, the question has great importance. At the time of Christ, the population of the world is believed to have been approximately 220 million. By 1500, the earth contained 450 million people, and by 1750, the global population exceeded 700 million. As the industrial and scientific revolution has accelerated, global population has responded by increasing at a break-neck speed: In 1930, the population of the world reached two billion; in 1958 three billion; in 1974 four billion; in 1988 five billion, and in 1999, six billion. Today, we have reached 7.6 billion, and roughly a billion people are being added to the world’s population every twelve years. T.R. Malthus’ “Essay on The Principle of Population”, the first edition of which was published in 1798, first study of population to stress the fact that, in general, powerful checks operate continuously to keep human populations from increasing beyond their available food supply. In a later edition, published in 1803, he buttressed this assertion with carefully collected demographic and sociological data from many societies at various periods of their histories. Malthus gives us a model of culturally-driven population growth. He tells us that population increase tends to press against the limits of the food supply, and since these limits are culturally determined, population density is also culturally-determined. Hunter-gatherer societies need large tracts of land for their support; and in such societies, the population density is necessarily low. Pastoral methods of food production can support populations of a higher density. Finally, extremely high densities of population can be supported by modern agriculture. Thus, Gell-Mann’s hyperbolic curve, should be seen as describing the rapidly-accelerating growth of human culture, this being understood to include methods of food production. If we look at the curve, P=C/(2025-t), it is obvious that human culture has reached a period of crisis. The curve predicts that the world’s population will rise to infinity in the year 2025, which of course is impossible. Somehow the actual trajectory of global population as a function of time must deviate from the hyperbolic curve, and in fact, the trajectory has already begun to fall away from the hyperbola. Because of the great amount of human suffering which may be involved, and the potentially catastrophic damage to the earth’s environment, the question of how the actual trajectory of human population will come to deviate from the hyperbola is a matter of enormous importance. Will population overshoot the sustainable limit, and crash? Or will it gradually approach a maximum? In the case of the second alternative, will the checks which slow population growth be later marriage and family planning? Or will the grim Malthusian forces – famine, disease and war – act to hold the number of humans within the carrying capacity of their environment? An analysis of the global ratio of population to cropland shows that we have probably already exceeded the sustainable limit of population through our dependence on petroleum: Between 1950 and 1982, the use of cheap synthetic fertilizers increased by a factor of 8. Much of our present agricultural output depends on their use, but their production is expensive in terms of energy. Furthermore, petroleum-derived synthetic fibers have reduced the amount of cropland needed for growing natural fibers, and petroleum-driven tractors have replaced draft animals which required cropland for pasturage. Also, petroleum fuels have replaced fuelwood and other fuels derived for biomass. The reverse transition, from fossil fuels back to renewable energy sources, will require a considerable diversion of land from food production to energy production. For example, 1.1 hectares are needed to grow the sugarcane required for each alcohol-driven Brazilian automobile. This figure may be compared with the steadily falling average area of cropland available to each person in the world: .24 hectares in 1950, .16 hectares in 1982. 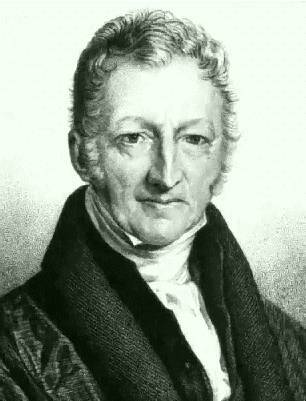 What would Malthus tell us if he were alive today? Certainly he would say that we have reached a period of human history where it is vital to stabilize the world’s population if catastrophic environmental degradation and famine are to be avoided. He would applaud efforts to reduce suffering by eliminating poverty, widespread disease, and war; but he would point out that, since it is necessary to stop the rapid increase of human numbers, it follows that whenever the positive checks to population growth are removed, it is absolutely necessary to replace them by preventive checks. Malthus’ point of view became broader in the successive editions of his Essay; and if he were alive today, he would probably agree that family planning is the most humane of the preventive checks. 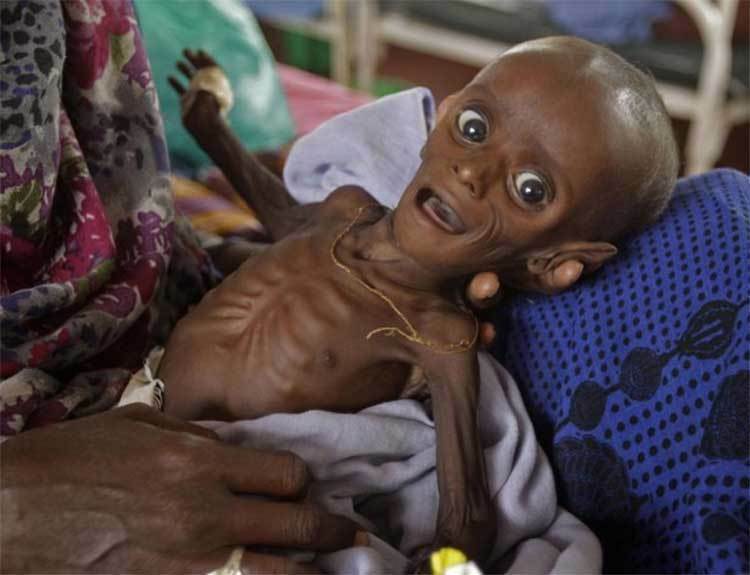 A starving child in Somalia. Today it is estimated that 30,000 children die every day from starvation, or from diseases related to poverty. In most of the societies which Malthus described, a clear causal link can be seen, not only between population pressure and poverty, but also between population pressure and war. As one reads his Essay, it becomes clear why both these terrible sources of human anguish saturate so much of history, and why efforts to eradicate them have so often met with failure: The only possible way to eliminate poverty and war is to reduce the pressure of population by preventive checks, since the increased food supply produced by occasional cultural advances can give only very temporary relief. Today, the links between population pressure, poverty, and war are even more pronounced than they were in the past, because the growth of human population has brought us to the absolute limits imposed by ecological constraints. since the increased food supply produced by occasional cultural advances can give only very temporary relief. Furthermore, the development of nuclear weapons has made war prohibitively dangerous. The resources of the earth and the techniques of modern science can support a global population of moderate size in comfort and security; but the optimum size is undoubtedly smaller than the world’s present population. Given a sufficiently small global population, renewable sources of energy can be found to replace disappearing fossil fuels. Technology may also be able to find renewable substitutes for many disappearing mineral resources for a global population of a moderate size. What technology cannot do, however, is to give a global population of 10 billion people the standard of living which the industrialized countries enjoy today. Anticopyright: Editorials and articles originated on TMS may be freely reprinted, disseminated, translated and used as background material, provided an acknowledgement and link to the source, TMS: Madmen and Economists, is included. Thank you. Thank you for your brief, but well put, doomsday description of our current historical/ cultural predicament with respect to population growth. But, your essay did not actually answer the question: “Why are economists addicted to growth”, unless I missed the explanation somehow. I have been observing, reflecting on and commenting on the human condition since I was twelve when I decided to become an independent thinker. That act of conscience got me sent down to the principle’s office for a debriefing which I, alas, cannot recall. Over the years, 52 to be exact, I’ve been able to glean a few rather simple insights. The first is that culture is not just a container for institutions or an expression of a cultivated character; it is a very powerful matrix that humans beings historically unfold, necessarily in order to be the kind of beings that they are. This means we not only create our cultures, but these social systems feedback upon us intimately guiding and conditioning our behavior in almost everything we do. Without cultures we wouldn’t have the communicative means to sustain ourselves let alone reproduce ourselves as sustainable social systems. This means that we need to pay extremely close attention to what cultures are all about for us. One very important aspect of culture is the economic sphere. It must be understood first, that any cultural aspect or sphere is embedded within a larger set of spheres which interact and mutually reinforce each other. Okay, so when speak or think about economic behavior we must always be cognizant of the rest of the cultural setting. Our economists and many of us non-economists are “addicted” to growth because it is deeply embedded within many cultures world wide, specifically the modern industrialized ones. With growth comes all those amenities we now take for granted, indoor plumbing, air travel, cars, television, air conditioning, bananas and oranges in the winter and so forth. The list is rather long. The problem as you rightly point out, however, is that indefinite material growth is clearly unsustainable. “Fractional reserve banking” banking along with lending at interest is one very powerful engine for the need for economic expansion. How we supply ourselves with money, the means by which we give ourselves access to what we need from what we produce, is one important aspect of why we seem to need an ever expanding economic output and accompanying consumption. In short, our economic activity from both ends, production and consumption, has to keep up with lending at interest and the ever increasing money supply created by banks via the mechanism of “fractional reserve banking” you mention. The situation is not actually “addiction”, but rather is deeply and necessarily mandated because of the kind of cultures we have evolved. Unfortunately, by labeling our predicament as “addiction” distracts from looking at the cultural basis of our behavior which includes as I’ve pointed out our economic behavior. It would take a me a book or several books to go into the vast intricate details of what I just outlined above. But, I would like to end this brief comment with another rather simple insight( again, not really original), but one that we are, alas, culturally conditioned to often deny. And, this is our profound and fundamental Need FOR others and to BE for others and this implies a straightforward recognition that we have “human lives” only within social groups, rather then in individualistic, competitive, isolated, alienated ways of living. The answer to “growth” is the recognition and the implementation of this insight in my opinion. It cannot be forced on us, however; but, it doesn’t have to be because it simply reflects the nature of what it means to be human. What all this amounts to is that every effort ought to be aimed at removing cognitive obstacles along with the political, social and economic preventing us from realizing our need for others. Of course, at almost every turn, we need to be prepared for considerable resistance because what we are dealing with and attempting by these efforts is nothing less then cultural transformation of the most deepest kind and I refer here to the survival of our species, moreover our humanity, for the foreseeable future which may not concern some very powerful interests.